New findings from the United Nations show that global development commitments – called the Millennium Development Goals – are off track. Governance and corruption are one of the culprits. Yet whole regions are behind on achieving the targets set for 2015, such as making sure all children are in school and that women get proper healthcare. People from these same regions are more likely to pay bribes when using basic services, according to Transparency International’s Global Corruption Barometer 2013. Percentage of respondents who report having paid a bribe to a key service in 20 of the poorest countries compared to the world average. These results show the terrible impact corruption has on efforts to fight poverty. Almost one of every two people living in poor countries reports having paid a bribe in the last year when trying to do such basic things as seeking services from public utilities, enrolling their child in school, interacting with the police and getting an identity card. The 20 nations included in the survey which fall among the least developed countries in the world have an average rate of bribery that is almost twice as high as the average for all 107 countries surveyed. 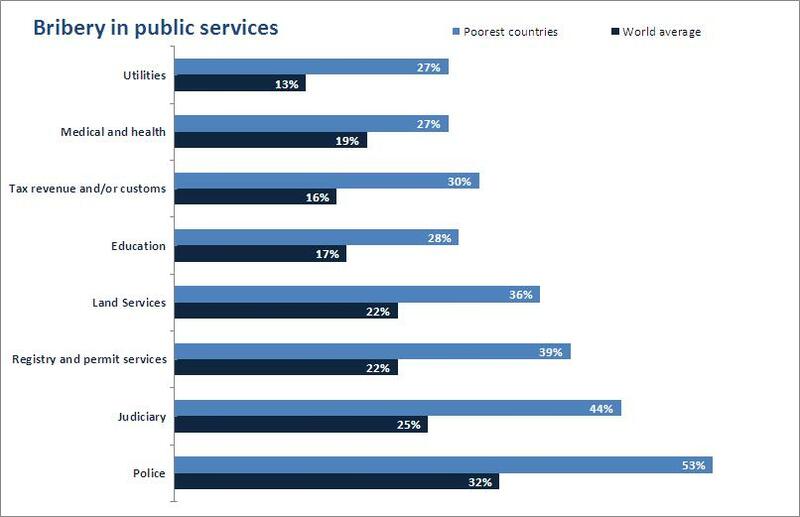 The survey, covering 114,000 people in 107 countries, shows that bribery levels were a shockingly high barrier to accessing public services in the world’s poorest countries. In Liberia and Sierra Leone more than three in four people report paying bribes to access basic public services like schools or hospitals. Many development goals such as increasing access to healthcare and literacy are undermined by corruption. More than one person in five coming into contact with education paid bribes in 20 of the poorest countries. Efforts to fight poverty and build infrastructure will continue to be undermined unless new development goals include specific targets for increasing transparency and the ability of citizens to hold their leaders and local services to account. Transparency International has called on the UN to adopt a goal on governance as part of new global commitments to succeed the current goals (or MDGs). Talks are already underway by governments on the issues that should make the cut for new commitments. A UN Expert Panel has pointed to governance being among them. TI India works with officials to sign public pledges about what services will be delivered. The pledges are monitored by civil society to cross-check if they are upheld. It would also respond to what people around the world are saying: more than 690,000 people surveyed in 194 countries have said that “an honest and responsive government” is among their top three development priorities. This reflects what the Transparency International survey shows: the majority of people in the poorest countries think ordinary people can make a difference and are willing to get involved. So the question is: will development efforts make the fight against corruption a priority?